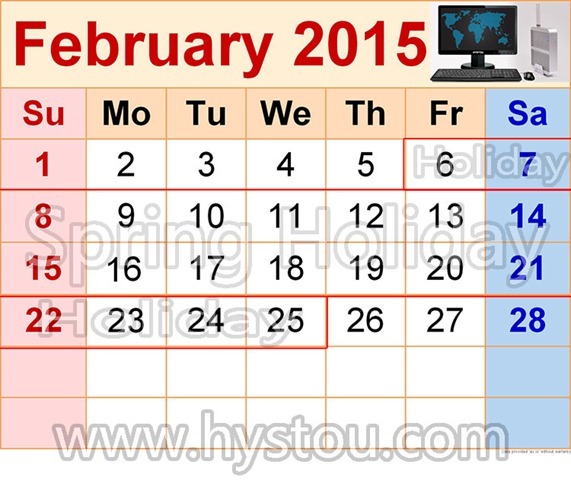 Hystou new year holiday arrange: 6th to 26th Feb, 2015. Chinese New Year is the longest and most important celebration in the Chinese calendar. 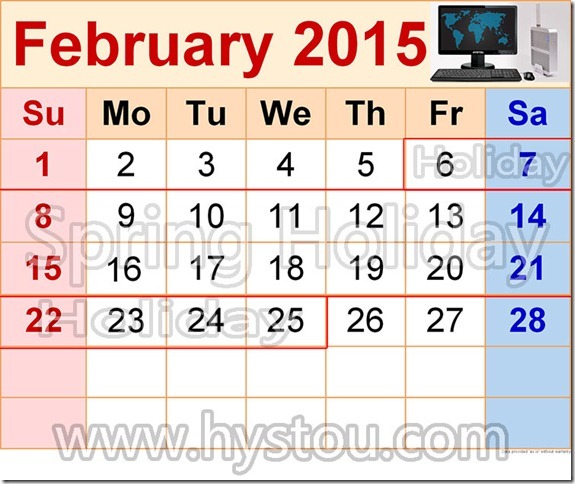 The Chinese year 4713 begins on Feb. 19, 2015. Chinese months are reckoned by the lunar calendar, with each month beginning on the darkest day. New Year festivities traditionally start on the first day of the month and continue until the fifteenth, when the moon is brightest. In China, people may take weeks of holiday from work to prepare for and celebrate the New Year. Legend has it that in ancient times, Buddha asked all the animals to meet him on Chinese New Year. Twelve came, and Buddha named a year after each one. He announced that the people born in each animal’s year would have some of that animal’s personality. Those born in sheep years are often artistic, charming, sensitive, and sweet. It is known as the most creative sign in the Chinese zodiac. Jane Austen, Boris Becker, Jamie Foxx, Mel Gibson, Michelangelo, Mark Twain, Rudolph Valentino,Barbara Walters, Bruce Willis, and Orville Wright were born in the year of the sheep. At Chinese New Year celebrations people wear red clothes, decorate with poems on red paper, and give children “lucky money” in red envelopes. Red symbolizes fire, which according to legend can drive away bad luck. The fireworks that shower the festivities are rooted in a similar ancient custom. Long ago, people in China lit bamboo stalks, believing that the crackling flames would frighten evil spirits. In China, the New Year is a time of family reunion. Family members gather at each other’s homes for visits and shared meals, most significantly a feast on New Year’s Eve. In the United States, however, many early Chinese immigrants arrived without their families, and found a sense of community through neighborhood associations instead. Today, many Chinese-American neighborhood associations host banquets and other New Year events.